When humans are injured, each of our tissues has an inherent ability (or lack thereof) to regenerate1. Interestingly, the regenerative ability of any given tissue can be very high, medium, or low/negligible. For example, the liver can regenerate after removal of ~75% of the tissue. In infants, digit tips can often be regenerated. Our skin has a reasonable regenerative capacity, albeit with fibrotic scarring. Finally, many of our tissues cannot be regenerated at all, such as entire limbs, cartilage in the ear, or the neurons and glial cells that make up the central nervous system (CNS; brain, eyes, and spinal cord). Indeed, if a human incurs an injury or disease of their CNS, the tissue does not regenerate. This often imposes a lifetime of required care on the healthcare system and annual costs in the billions of dollars. However, not all hope is lost. Not only do humans have the capacity to robustly regenerate neurons and glia in our peripheral nervous systems (PNS; all the rest of the neurons not in the CNS), but closely related vertebrates have no trouble regenerating CNS tissue2. Thus, CNS regenerative ability is ancestral and the latent regenerative ability is even still functional in our PNS. The ultimate hope is that this latent regenerative ability in humans can be reactivated for CNS injury or disease. In order to contextualize why humans cannot regenerate CNS tissues, it is critical to study how this process is accomplished in model laboratory organisms that have a high capacity to regenerate the CNS3. There are several fantastic laboratory models of spinal cord and brain injury. For vertebrate models, multiple amphibians can regenerate from CNS injuries4. However, the zebrafish is perhaps the best genetic model of CNS regeneration5. For invertebrate models, none is better for testing gene function during CNS regeneration than the freshwater planarian (flatworm)6. Amazingly, the most common laboratory species of planarian, Schmidtea mediterranea, can be decapitated and regenerate the ~5,000-10,000 neurons of the missing brain, eyes, and nerve cords in approximately 7 days (Fig. 1). Further, this process can happen an unlimited number of times and occurs without scarring. Because planarians also have the advantage to be able to rapidly test gene function in a regenerative context, much effort is now being put forth to understand this unique biology. 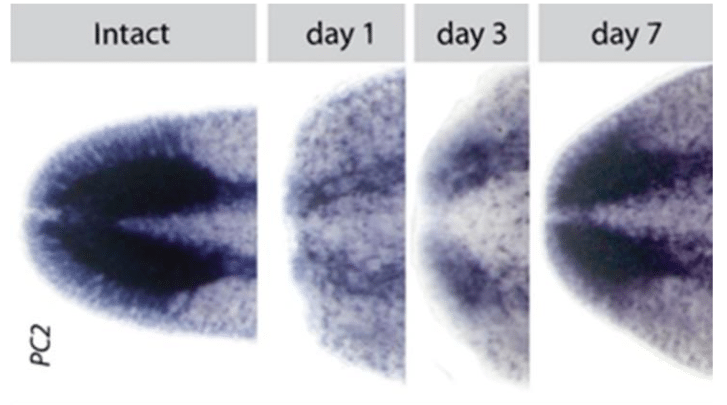 There are several key steps to the regeneration of a new planarian brain7. First, the resident stem cells in the planarian body must sense what tissue is missing and mount a regenerative response to make all the new cells destined to be the new neurons of the brain. Second, the appropriate neuronal types must differentiate in the correct numbers in the correct spatial locations. Finally, all the patterning of the size/scale of the brain, as well as connecting new neurons with their correct post-synaptic targets, must occur in order to restore function. If one considers the finely patterned neural subtypes in the final brain (Fig. 2), it is clear that this is complex process must coordinate multiple aspects of cell biology such as proliferation, differentiation, and extrinsic patterning. In order to further understand the molecular underpinnings of planarian brain regeneration, we have taken to testing the function of transcription factors we know to be expressed specifically in animals that are regenerating new brains and heads. Recently, we describe one of these factors, tcf-1, which is a homolog of a TCF/LEF type transcription factor, typically involved in repressing or activating downstream targets of the signaling molecule WNT 8. When we removed the tcf-1 function from regenerating brains, we found that only neuronal subtypes in the lateral regions of the brain were affected. We went on to further show that light sensation from planarian eyes are specifically wired into the lateral GABAergic type neurons, which depend on tcf-1 function during regeneration. Together, we believe that tcf-1 helps repress genes that would otherwise send new neurons down alternative medial cell fates decisions. In future studies, it will be interesting to discover what genes and pathways are upstream of tcf-1 as well as how tcf-1 antagonizes alternative fates that are also needed to be produced during regeneration. It will be important to understand the cascade of cell fate choices and mechanisms controlling wholesale brain regeneration in planarians, and then apply this to trying to understand how human CNS regeneration fails in order to circumvent this blockage in patients. These findings are described in the article entitled The planarian TCF/LEF factor Smed-tcf1 is required for the regeneration of dorsal-lateral neuronal subtypes, recently published in the journal Developmental Biology. This work was conducted by David D.R. Brown, Alyssa M. Molinaro, and Bret J. Pearson from the Hospital for Sick Children and the University of Toronto. Birnbaum, K. D. & Sanchez Alvarado, A. Slicing across kingdoms: regeneration in plants and animals. Cell 132, 697-710, doi:10.1016/j.cell.2008.01.040S0092-8674(08)00141-4 [pii] (2008). Tanaka, E. M. & Ferretti, P. Considering the evolution of regeneration in the central nervous system. Nat Rev Neurosci 10, 713-723, doi:10.1038/nrn2707nrn2707 [pii] (2009). Becker, C. G. & Diez Del Corral, R. Neural development and regeneration: it’s all in your spinal cord. Development 142, 811-816, doi:142/5/811 [pii]10.1242/dev.121053 (2015). Moon, L. & Bunge, M. B. From animal models to humans: strategies for promoting CNS axon regeneration and recovery of limb function after spinal cord injury. J Neurol Phys Ther 29, 55-69 (2005). Becker, C. G. & Becker, T. Adult zebrafish as a model for successful central nervous system regeneration. Restor Neurol Neurosci 26, 71-80 (2008). Gentile, L., Cebria, F. & Bartscherer, K. The planarian flatworm: an in vivo model for stem cell biology and nervous system regeneration. Dis Model Mech 4, 12-19, doi:10.1242/dmm.006692dmm.006692 [pii] (2011). Ross, K. G., Currie, K. W., Pearson, B. J. & Zayas, R. M. Nervous system development and regeneration in freshwater planarians. Wiley Interdiscip Rev Dev Biol 6, doi:10.1002/wdev.266 (2017). Brown, D. D. R., Molinaro, A. M. & Pearson, B. J. The planarian TCF/LEF factor Smed-tcf1 is required for the regeneration of dorsal-lateral neuronal subtypes. Dev Biol 433, 374-383, doi:10.1016/j.ydbio.2017.08.024 (2018). Bret Pearson is a gene expression and stem cell researcher at University of Toronto | U of T · Department of Molecular Genetics.